As a motivational speaker, he has spoken in the United States, Taiwan, Canada, Jamaica, Qatar (Doha), England, Bahamas, Hong Kong, China, Saudi Arabia, Kuwait, Indonesia, Japan, South Africa, India, Sri Lanka, and Australia giving as many as 160 presentations per year. He is the 1999 World Champion of Public Speaking for Toastmasters International. Make your next event the best ever!Click here to book Craig now! 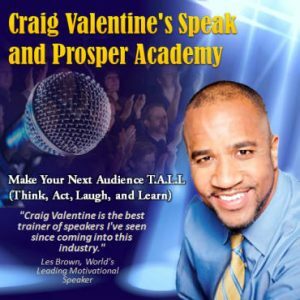 win Events Manager of the Year for the National Small Business Council, Inc.
Craig Valentine is also the Co-Founder of the World Class Speaking program, which helps up-and-coming speakers and speech coaches turn their presentations and programs into huge profits. Craig is the author of the groundbreaking book, The Nuts and Bolts of Public Speaking, Co-Author of the books, World Class Speaking and World Class Speaking In Action, and contributing author for the books Guerrilla Marketing on the Front Lines, Success Secrets of the Social Media Marketing Superstars, and Guerrilla Marketing Remix. Craig has an MBA from Johns Hopkins University.